My hardworking husband likes to indulge in a latte or mocha just about everyday. His favorite stop: Starbucks. Many of you Seattle area residents know how addicting and costly this habit can be! As an investment moving forward (under the guise as a Father’s Day/Birthday gift) – I purchased a Nespresso Citiz & Milk for my hubby. This machine is amazing! Super convenient and easy with quality that is hard to match – the reviews on Amazon say it all. When I first started exploring the idea of purchasing an espresso machine, I was completely overwhelmed by the information I found online. There are so many different brands and machines ranging from as low as $30 to $2000 and up! And those aren’t even commercial machines. Apparently there is an entire world of Espresso out there with a language all its own not to mention all the terms for how to prepare the best shot – do you want ristretto or lungo, make sure your machine produces great crema, don’t over or under tamper down the grounds, steam the milk just like so and on and on. I was concerned that no matter what machine I purchased, if I chose one that required this many decisions each day and the manual labor and effort in the preparation and clean up that my husband would end up at Starbucks on occasion for the convenience, ease and quality it offers. With this kind of investment, I wasn’t willing to take that risk! 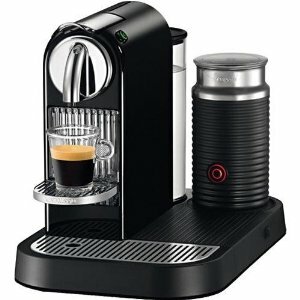 I purchased my machine from Macy’s during a one-day sale for $299 and qualified for a $50 credit towards capsules through Nespresso. The only downside to this machine is that it uses proprietary capsules of espresso that are .54 each. For us, the convenience and predictability are worth every cent. This machine is as easy as the touch of button for both the espresso and the milk – literally. And there is no guesswork involved. The clean up is so simple, it literally takes 1 – 2 minutes start to finish to gather the ingredients, make a terrific latte and have the machine clean and ready to use. The machine comes with a sampler of each of the 16 varieties of capsules which is great since the capsules can only be purchased online or via phone and come shipped to your door in 2 business days. I highly recommend this machine and am very impressed by the quality of their product. Nespresso is based out of Europe and has been around since the ’80s. I think even some of the pickiest coffee connoisseurs would be pleased. Other tidbits: the espresso produced has great crema and the machine uses 19 bars of pressure when extracting.